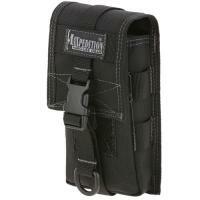 Keep a variety of tools at hand and easily accessible with the TC-2 Pouch from Maxpedition. The 1000-Denier nylon construction, topped with a Teflon coat for impressive water and grime resistance, guarantees the pouch will look great for years. Additional water resistance comes from the triple polyurethane coating. The high tensile strength nylon webbing and thread contribute to the durability of the construction. Stress points are double stitched and reinforced as well. For versatility in carrying, choose from three methods of transportation: a belt loop or the optional accessories #9051, a 1.5-inch shoulder strap to paracord loops, or #9903, a 3-inch TacTie™ attachment strap for PALS.